Financial services can play a critical role in unlocking Africa’s vast mineral wealth by lending to companies that operate in the mining and metals, oil and gas as well as power and infrastructure sectors. Only by providing sophisticated financial services solutions will African nations be able to facilitate greater investment in their natural resources and infrastructure sectors... and ultimately boost their economic growth rates. 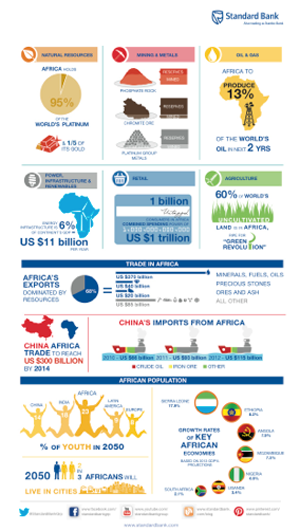 The world is turning to Africa as the next destination for development and for growth. The themes we are seeking to bank are continent-wide and link the countries of Africa with the rest of the world. The fact that Africa has been our home for 151 years, gives us a strong competitive advantage to deliver on our strategy of connecting investors from around the world with the CIB franchise. Standard Bank Corporate and Investment Bank (CIB) aspires to be the leading investment banking in, for and across Africa, with a deep specialisation in natural resources. Our on-the-ground presence in the 18 African markets in which we operate, coupled with our connectivity with China and other key markets, means we are well-positioned to deliver ‘fit for purpose’ banking solutions to our clients. Our goal is to optimise the value we provide to our CIB clients by drawing on our skills and capabilities across Africa to maximize ‘franchise value add’ through the delivery of a consistent CIB offering and experience that enables us to maximise cross-selling opportunities and deliver optimal financial resource utilisation. Our CIB franchise currently spans the entire Southern African Development Community (SADC) as well as Ghana, Nigeria, South Sudan, Angola, Tanzania, Kenya and Uganda. Our activities on the continent outside of South Africa now account for approximately one third of CIB revenue thanks to strong loan book growth, improved margins and increased origination and distribution. Although South Africa remains the anchor of our CIB operations, the rest of Africa is absolutely central to our growth strategy going forward. We will continue to focus on providing fit-for-purpose financial solutions that link Africa to international investors.